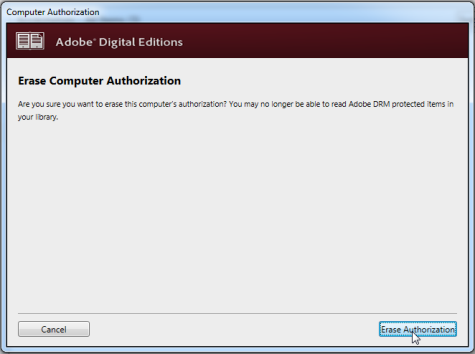 To download DRM-protected ebooks to your computer and transfer them to compatible ereaders, you'll need to install and authorize Adobe Digital Editions (ADE). 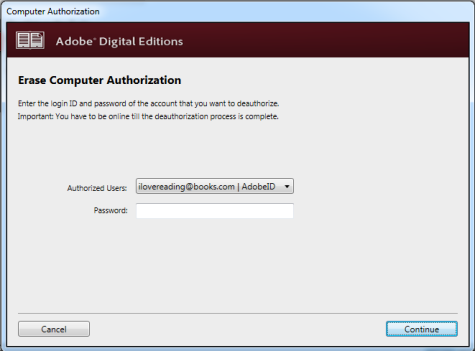 To download the same ebooks to additional computers or devices, be sure to authorize each one with the same OverDrive account or Adobe ID. You can authorize up to six devices with one account. If you plan to use ADE and the OverDrive app, we encourage you to use your OverDrive account to authorize ADE. That way, you won't run into authorization issues when you download the same ebooks on your mobile device and on your computer. Use the steps below to authorize ADE. If you aren't prompted to authorize ADE the first time you open it, go to Help > Authorize Computer. 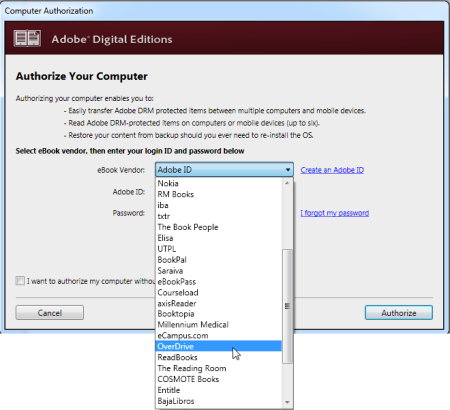 Select OverDrive (recommended) or Adobe ID from the eBook Vendor drop-down menu. Enter your email address (or Adobe ID) and password, then select Authorize. Note: You won't be able to authorize ADE with an OverDrive account that was created using a library card or Facebook. 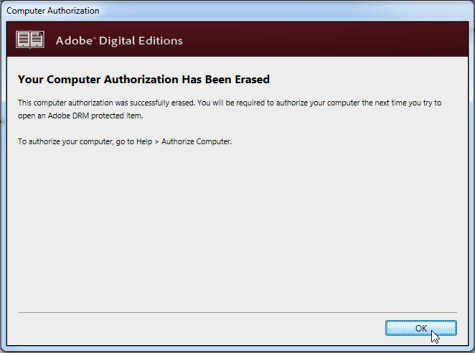 You'll need to clear your current ADE authorization if you want to authorize your computer with a different OverDrive account or Adobe ID. Sometimes, clearing your authorization can fix transfer or download trouble as well. Note When you clear your authorization, any ebooks you previously downloaded to ADE will no longer work, because they're tied to the authorization you used to download them. Use the steps below to deauthorize ADE. Press Ctrl + Shift + D on a Windows computer or Command + Shift + D on a Mac. Make sure the correct account is listed in the drop-down menu, enter your password, then click Continue. Click OK to close the dialog box and return to ADE. The next time you try to download a borrowed library book, you'll be prompted to authorize ADE again.